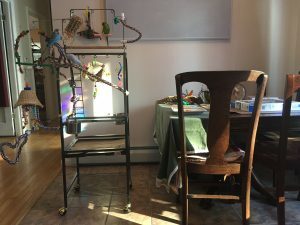 Posted on April 24, 2018 April 24, 2018 Categories Our Parakeet StoryTags budgie sleep, cage, parakeet, setup5 Comments on The budgies have their own room – finally! 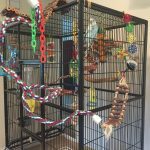 Getting ready for quarantine – new parakeet coming soon! I’m sort of freaking out with excitement. 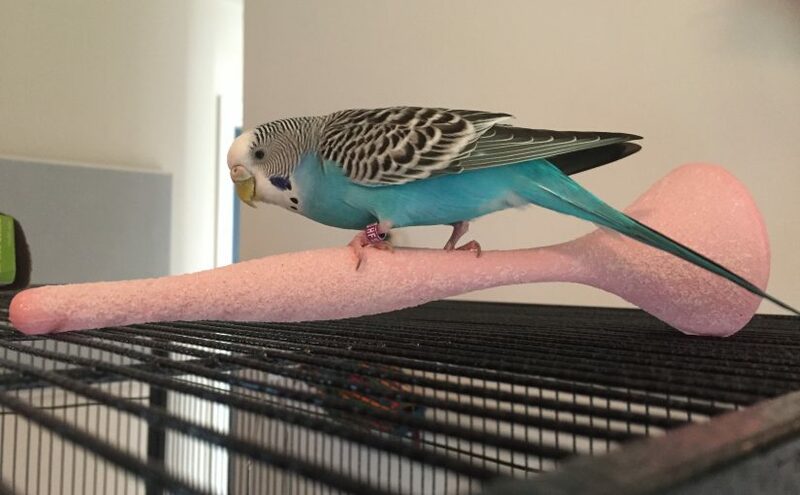 After our initial plans to get a boy parakeet in early November didn’t pan out due to our plumbing issues it was starting to feel a bit remote that we would actually get a boy budgie added to the flock. Happily, things have quieted down and we are going to go pick out our new boy this Saturday! 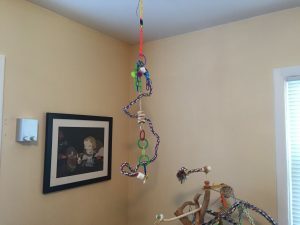 This means it is finally time to get ready for a new parakeet quarantine. Quarantine is important for a few reasons. One is that if the new budgie comes in carrying diseases we want to avoid spreading them to our existing flock. Some diseases can be transmitted by touching only, and some are airborne. The new budgie also could have mites, and we would definitely want to avoid transmitting those. 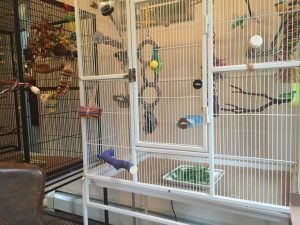 The new parakeet will be quarantined in a separate room for 30 days, which should be enough time to know if he is sick. During that time we will have to be careful to wash our hands thoroughly before and after interacting with him. Ideally he would be in a totally separate air space, but that’s not totally possible. The room he’s going into will get too cold at night if the door is shut, so we’re going to keep them as separate as possible and take all the precautions we can, even if it’s not perfect. The 30 day quarantine should also give us time to get to know our new flock member and bond with him one on one. So, more than an inconvenience, it’s really an opportunity. We didn’t quarantine Kelly and regretted it deeply, not just because we took a risk with Toby’s health, but also because it made our bonding with her much more difficult. I still wonder if working with her during a quarantine would have lessened her aggression towards us. 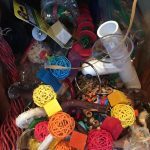 I debated quite a bit on where to get our new fellow, and finally landed on a locally owned pet store, Benson’s. 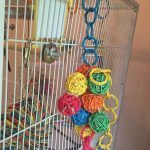 It’s not as great as getting a rescue budgie, but we really have some specific needs for our new friend and I know that rescues like to adopt out pairs or more of parakeets. 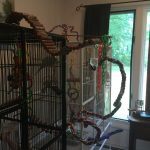 I am glad to support a local business instead of a big chain store, and we’ve checked out their aviaries, which are amazing! 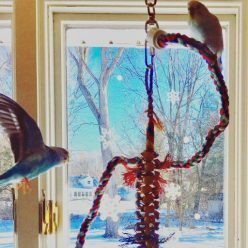 The parakeets look like they are in great condition, both physically and mentally. 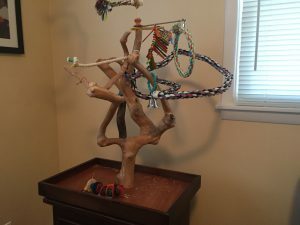 To get set up for our new fellow I barely had to buy anything, due to the expansive nature of my toy and perch hoard. 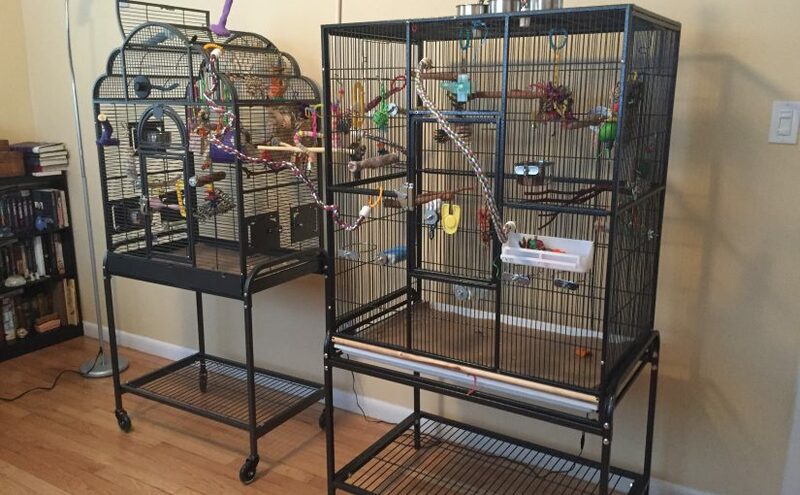 We also already had an extra cage on hand (technically 3 extra cages, but who’s counting!). 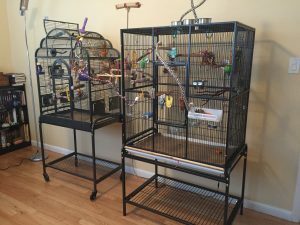 Since we upgraded Toby and Kelly to flight cages, it meant we had the Drs. Foster & Smith HQ Victorian Top Cage ready and waiting. 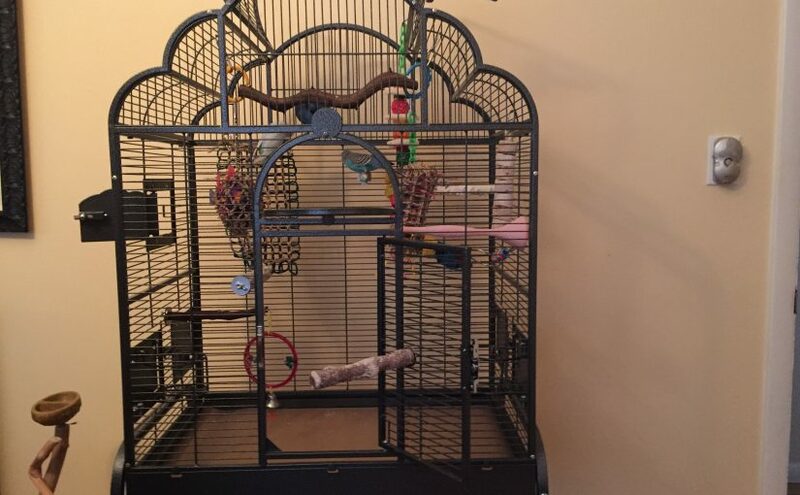 It’s a bit bigger than a traditional quarantine cage, but particularly since the new guy will be used to having quite a bit of room I think he’ll be okay. They clip birds before you bring them home at the local shop, and although I’m not a fan of lifelong clipping, it will make me feel less nervous transporting him. Also, I think that if we play our cards right, his being clipped will help accelerate the taming process. 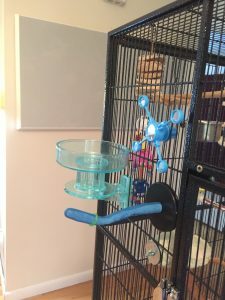 We put a careful eye towards designing his quarantine cage for maximum accessibility in terms of hopping around and climbing the bars from perch to perch. When we bring him home, I will also make sure to get a supply of whatever he is used to eating to make sure he doesn’t reject a new food when he’s already freaked out about being in a new place. I think we’ve got everything lined up for as smooth a transition as possible. Now all I have to do is make it through the next 24 hours without bursting with excitement! Wish me luck, and watch my Facebook Page for a pic of the new fellow tomorrow! 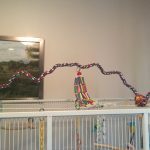 Posted on November 24, 2017 November 20, 2017 Categories Budgie Tips and Tricks, Our Parakeet StoryTags basics, health, homecoming, necessities, new parakeet, parakeet, parakeet health, setupLeave a comment on Getting ready for quarantine – new parakeet coming soon! Oh how things have changed since you came along! 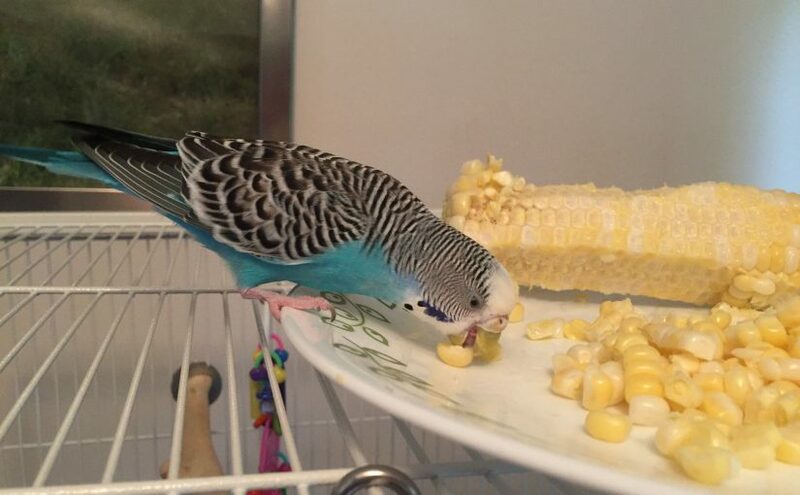 I’ve loved birds since I was a little girl, but I never thought I’d be able to have one of my own. I was at a bit of a low point when we got you, struggling with some personal issues and I can’t say how much I needed a lift. As unbearably cheesy as it sounds, I was lifted on your wings. Taming you gave me a whole new purpose and a reason to look forward to coming home at the end of a work day. Moreover, thinking about you made me happy any time of day. You were a unifying force of positivity for my husband and me as we worked together to make sure that you were happy, safe and comfortable. 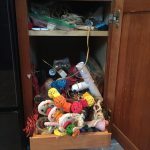 We discovered that we both loved planning your environment for maximum enrichment and spending time training you and cajoling you into being part of our flock. I remember how scared you were when you first came home, and the utter joy I felt when you started to open up and relax. Discovering your sense of humor and your sass came shortly after, but also the realization that you felt very connected to us, and wouldn’t go anywhere that your flock didn’t want to go. Now that you’re a very grown up girl you certainly have your own sense of self and what you’ll allow, but you’re also a good listener and so eager to learn. I love that you are calming down some and starting to perch on a finger for longer times, rather than landing and flitting off to your other important business. I’d like to say that you’re a great big sister to Kelly, but since you tried to chew off her foot and pull out her feathers I really can’t go that far! 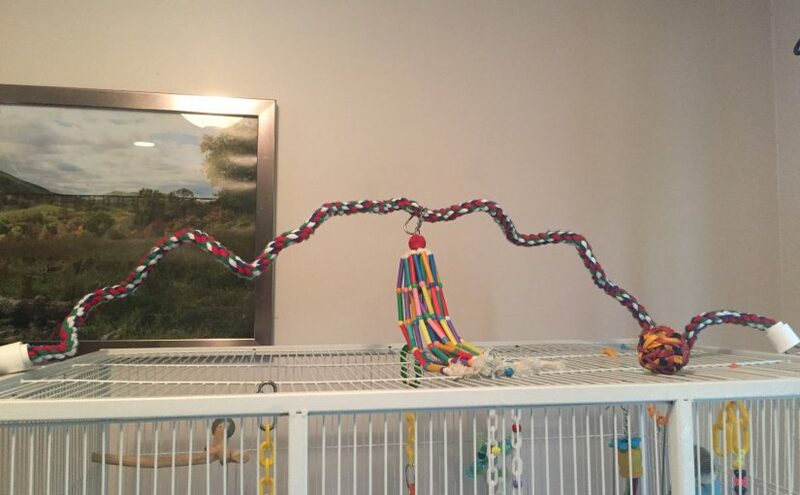 I think she’s been good for you, and taught you loads of birdy stuff that you didn’t manage to learn at PetSmart, so I hope you keep trying to love her a bit more.